The LaGare Hotel Venezia opened in 2013 as the first four-star hotel on the glassmaking island of Murano. (See our illustrated Murano Travel Guide). 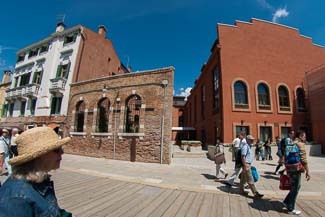 The 118-room hotel is directly across from the Murano Museo landing of the Alilaguna Linea Rossa water bus, which stops in Murano on its way between the airport, the Lido di Venezia, and San Marco from late April until early November. The map and directions below show how to reach the hotel from Murano's two Alilaguna airport-boat stops: Museo (seasonal) and Colonna (year-round). Cross the fondamenta (sidewalk) to the LaGare Hotel Venezia's entrance, which is in the courtyard that faces the pier. As you leave the Colonna boat stop, turn right and follow the waterfront, which will curve left into a canal. Continue walking along the canal until you've passed the San Pietro Martire Church and reached a junction with a wider canal. Cross the large bridge over the wide canal. As you leave the bridge, bear right and walk along the waterfront for a minute or two. When you reach the Murano Museo waterbus stop, turn left into the hotel courtyard.